The GSC is assisting the Waukegan Harbor Citizens’ Advisory Group (CAG) in an effort to restore natural areas in Waukegan, IL as part of US EPA’s Great Lakes Restoration Initiative. One of the areas under restoration is Bowen Park, formerly a boys and girls summer camp donated to Jane Addams’ Hull House Settlement by her friend and benefactor, Louise Bowen. The park is mostly uplands on the eastern edge of the Highland Park moraine overlooking the Chicago Lake Plain. Post-glacial drainage erosion of these uplands has created steep-walled Glen Flora ravine through the park. CAG had already started restoration work at the site when the severe storms of the summer of 2011 struck. That’s when they called in the GSC for help. Runoff from the uplands overran the man-made and natural drainage systems to threaten park facilities with severe erosion. High winds had downed many trees, blocking trails and impacting restoration efforts. CAG initially asked the GSC to map the tree damage. 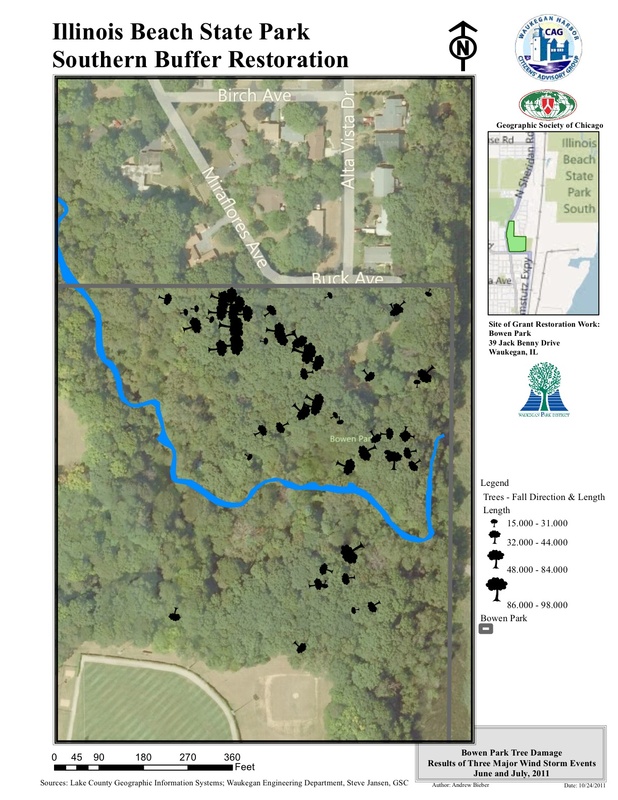 Steve Jansen, a GSC director, used the GSC’s handheld GPS units to locate, tag, and measure nearly 100 instances of downed or severely damaged trees as part of a CAG team which also included a botanist and land restoration managers. The field data was incorporated into a GIS system created by Drew Bieber, also a GSC director. 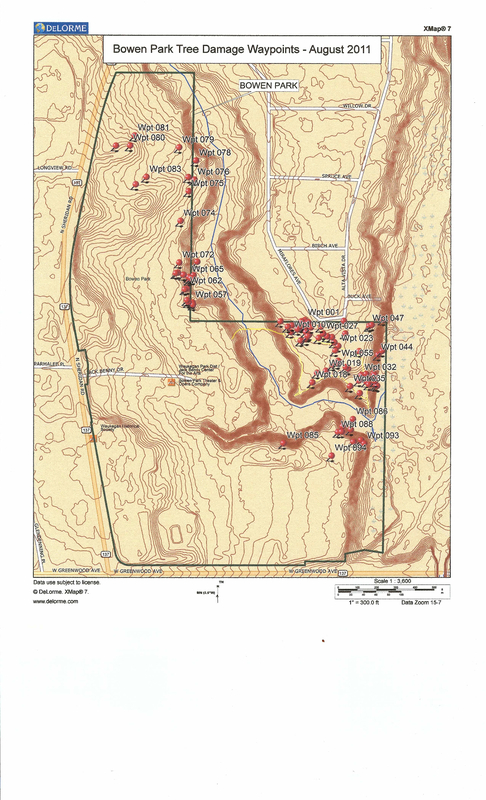 The GSC team produced numerous maps (see below) to help CAG recover from the damage. GSC’s continuing work at Bowen Park includes a floristic and geomorphic inventory of plants of interest, invasive species, and current and potential erosion and deposition areas. We also are working with CAG on their restoration efforts on a 2.3 mile stretch of beaches, dunes, and swales along the Lake Michigan shoreline south of Illinois Beach State Park. We are now mapping baseline conditions for areas degraded by invasive species and current and potential habitats for endangered and threatened species. We will track progress on restoration work as it begins in 2012.